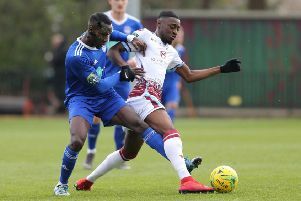 Hastings United Football Club’s players and management staff haven’t spoken about winning during their upturn in form, according to manager Chris Agutter. Hastings are top of the Bostik League South East Division form guide for the last six matches having picked up 16 points from a possible 18. Those results have left second-placed Hastings 10 points behind leaders Cray Wanderers, but five ahead of third-placed Ashford United and 10 better off than the team just outside the play-offs, VCD Athletic. Agutter said: “I think all the time you’ve got a young group of players, there’s a lot of development and we need to focus on that. “We need to keep trying to improve individual players and that will contribute to improved team performance, which in theory should keep the scoreboard ticking over. “I just think we need to concentrate on development of the players and if we do that, that should come hand in hand with winning. “I think we’re top of the form guide and during that time since we had a sticky patch we’ve not once spoken about winning; we’ve always spoken about performance. “There’s a list of bullet points in the dressing room that they (the players) need to do. If they do those and work hard, but don’t win, that’s the staff’s problem because we’ve done something wrong set-up wise. Hastings are the division’s highest scorers with 49 goals in 21 league matches and only two teams have conceded fewer than the 24 goals they’ve conceded. They will seek to keep the unbeaten run going when they travel to Herne Bay today (Saturday), kick-off 3pm. Although second-bottom of the table and beaten 5-0 in November’s reverse fixture at The Pilot Field, Herne Bay are fourth in the form guide for the last six games having won four of them. Jack Tucker’s loan from Gillingham will expire after today’s match and Agutter’s initial reaction after his injury-enforced early substitution during the 3-0 win at home to Whyteleafe last weekend was that he’d be surprised if the defender was fit for the trip to north Kent. Hassan Ibrahiym, a midfielder who Agutter rates very highly, also came off in the first half against Whyteleafe. “Hass is our Darren Anderton - he keeps picking up injuries, but he’s just got so much quality,” said Agutter.